In Japan: Running Out Of Places To Put Radioactive Water : The Two-Way The Fukushima Daiichi nuclear power plant was crippled in March 2011 by an earthquake and tsunami. Groundwater continues to pour into its reactor buildings, and workers are pumping it out. A forest likely will be cut down to make room for more storage tanks. Meanwhile, some storage facilities are leaking. 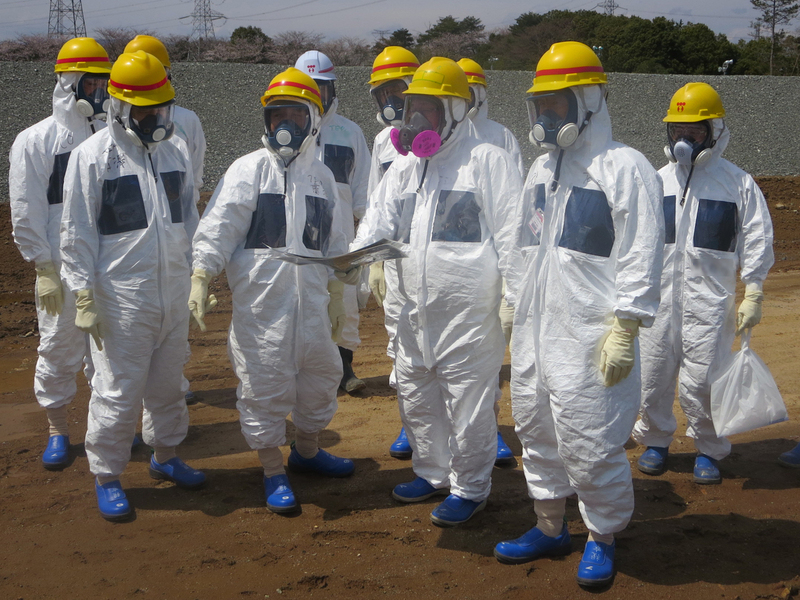 As they inspected an underground storage pool near the crippled Fukushima Daiichi nuclear power plant earlier this month, Tokyo Electric Power Co. President Naomi Hirose (4th from left) and other officials wore protective suits and masks. Radioactive water stored in some of the pits has leaked. "Two years after a triple meltdown that grew into the world's second worst nuclear disaster, the Fukushima Daiichi nuclear power plant is faced with a new crisis: a flood of highly radioactive wastewater that workers are struggling to contain." According to the Times, at the power plant crippled by an earthquake and tsunami in March 2011 "groundwater is pouring into the plant's ravaged reactor buildings at a rate of almost 75 gallons a minute." In response, "a small army of workers has struggled to contain the continuous flow of radioactive wastewater, relying on hulking gray and silver storage tanks sprawling over 42 acres of parking lots and lawns. The tanks hold the equivalent of 112 Olympic-size pools." But more storage space is needed. So, the Times adds, Toykyo Electric Power Co. "plans to chop down a small forest on its southern edge to make room for hundreds more tanks, a task that became more urgent when underground pits built to handle the overflow sprang leaks in recent weeks." On Morning Edition earlier this month, NPR's Geoff Brumfiel said some of the contaminated water is leaking from storage pits that have also been used at the site. "They are just earthen pits that have been lined with sheets of plastic, and the plastic may have torn or it may just leak," he said.